Metro Atlanta has a rare opportunity to transform itself in the coming years. Over the next decade, $3 billion will be spent on transit and infrastructure, fueling investments and driving changes in housing, health, and the built environment. In 2016, the city passed two referenda that will bring substantial capital investment to transit infrastructure in the region, including a $2.5 billion referendum to expand the Metropolitan Atlanta Rapid Transit Authority (MARTA) bus and rail lines and a sales tax increase, which will raise an estimated $300 million over five years for projects including the Atlanta BeltLine, a network of public parks, multi- use trails, and transit along a historic 22-mile railroad corridor connecting 45 neighborhoods. Both MARTA and the BeltLine have set goals for building affordable housing units along their routes. 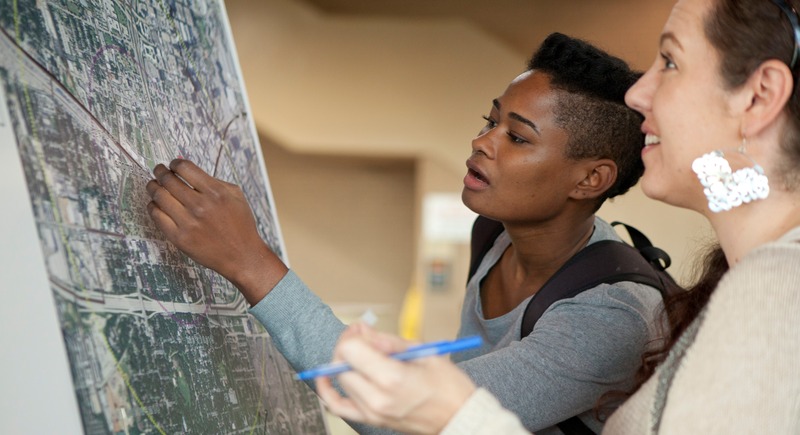 In addition, the Board of the Atlanta Regional Commission (ARC) adopted the Atlanta Region’s Plan in March of 2016, which advocates for equity, health, affordable housing, and climate actions, prioritizing $12 billion for transit expansion projects. These local investments are creating momentum for systemic and regional change, but partnerships and resources are needed to ensure development is equitable. Atlanta is a city of great opportunity for some and entrenched economic stagnation for others. The city ranks third in the number of Fortune 500 corporate headquarters. However, in studies of the 50 largest metropolitan areas in the U.S., Atlanta is consistently ranked last or nearly last in income mobility. A child raised in the bottom fifth of incomes in Atlanta has just a 4 percent chance of reaching the top fifth due to lack of opportunities in the communities where they are raised. There are an estimated 328,000 “housing insecure” households in metro Atlanta, meaning people pay more than 50 percent of their income on housing and transportation costs. Nationally, Atlanta ranks 91st out of 100 of the largest metro regions for job access via public transportation, with only 3.4 percent of jobs accessible by a 45-minute public transit commute or less. Atlanta continues to be shaped by the historical impact that structural racism and discriminatory policies at the federal and local level have played in the region. Investment and growth have favored the majority white neighborhoods to the north of Interstate 20, and concentrated poverty in the predominantly black neighborhoods to the south. The median household income is $25,384 for black households and $80,993 for white. This dynamic is connected to and reinforced by geography, concentrated poverty, extensive traffic, and an inadequate public transit system which make it extremely difficult to access job opportunities. Download the SPARCC Atlanta Regional Profile.